About two weeks ago we attempted to do a photo-shoot to be used in some marketing material for the 2 Hip Chics Boutique. Shelly started getting some of her new shipments in and these cute little aprons and matching hot pad sets immediately jumped out at us. They are absolutely adorable..... made of vinyl so they clean very easily and the straps are totally adjustable. Not only do they come sized for children, but for adults as well. so we bailed on the project. Our other pastry chef did not want to give up so easily and said she wanted to keep the mixer going, so we let her have some fun solo. The end result... not exactly what I set out for in the beginning, but the pics were too cute not to share. We staged the pastries to make it look like they were making them and placed them on the pedestals that are also from 2 Hip Chics Boutique. These are the pastries I brought home from the Italian Bakery you saw in my instagram photo, La Dolce Vita.... everything is so incredibly good, but my favorite indulgence is their cannoli. Remember the no sugar streak? I broke it that day.... It was St. Patrick's Day and I had to have one of those Cannoli. I did not regret it.... not one bit. It was worth the cheat! So much so, that I am headed back there tomorrow and we will be enjoying more of their goodies on Easter Sunday. We are hosting and look forward to seeing our family and will be praying that the weather holds out and the kids can have an Easter egg hunt outdoors. Looks like some rain is in the forecast, but we are crossing our fingers regardless. Hope you have a wonderful weekend and a Blessed holiday. Lisa, I LOVE these shots!! Everything about them: composition, colour, editing. So precious and such a fantastic set! Have a great Easter holiday weekend! Adorable -- and here I thought you all made those lovely treats. Lol. Happy Easter Lisa! Hope you have a fabulous day. We are doing the same here. Looking forward to a good meal with family. What a fun time, my girls have very similar aprons and love to wear them every time they "help" me in the kitchen. Have a lovely Easter. She looks so precious! And so big! Love the photos! I love this collection of photos - everyone looks like they had such a good time. And treats too - I wish you a happy Easter! These photos are so cute!! Have a very Happy Easter. 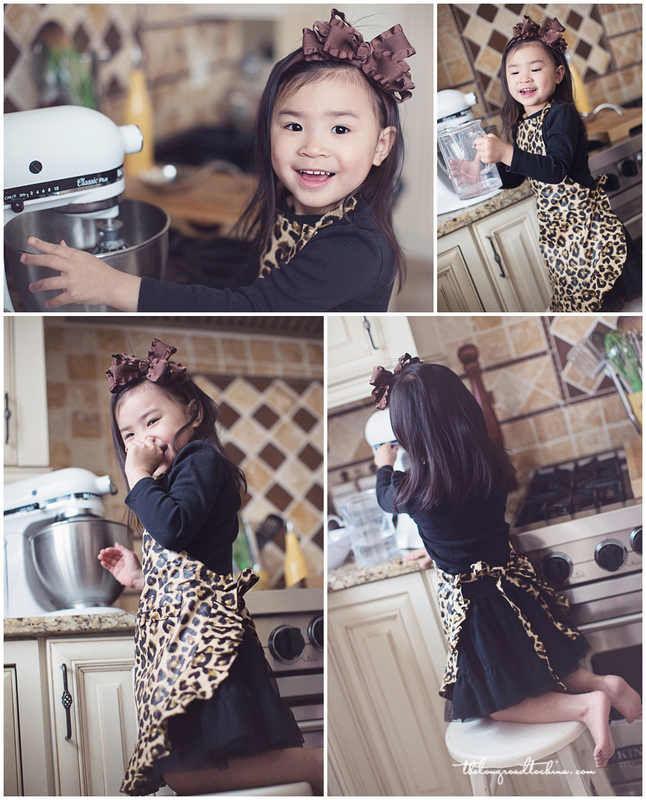 These are adorable- love the apron. Hope you have a blessed Easter my dear friend! Hugs! Very endearing post. Thanks for this. Love these shots! THe aprons are cute and it looks like they had a blast! Love these!! Such precious photos! Reagan is just so comfortable in front of the camera. I understand why you wanted to share them. Happy Easter Lisa to you and your beautiful family. Always a pleasure, you girls are the sweetest. Happy Easter! 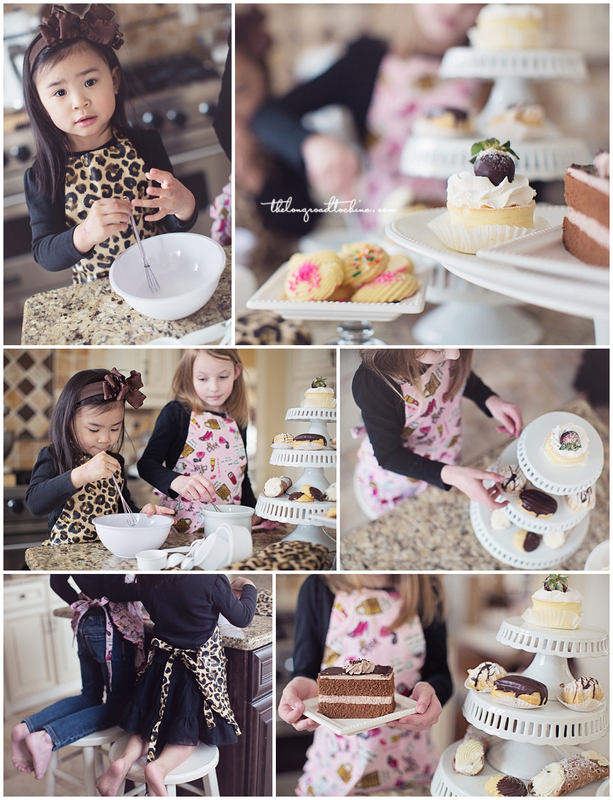 Love the photos and the aprons are just darling! Happy Easter to you! Good Lord, Reagan has shot up and her hair has gotten so long! She's still a little doll though! Poor Sarah does look as though she's coming down with something in the first photos, hope she's feeling better now. Mmmm, Lisa, I would have broken a no sugar pledge too! Those pastries look so very delicious! Happy Easter, have a good one! R looks like she was having a blast playing chef! Hope Sarah feels better soon. These are so beautiful of your little bakers! Love the aprons! Have a happy Easter! Happy Easter Lisa. These are extraordinary! Your lighting in the pics are always spot on. They make me do a happy sigh. Hope Sarah feels better. Happy Easter! Those girls are as cute as ever. I cannot get over how Reagan has grown and changed lately..and her hair is so long!